Straight Lines is an important topic of coordinate geometry. 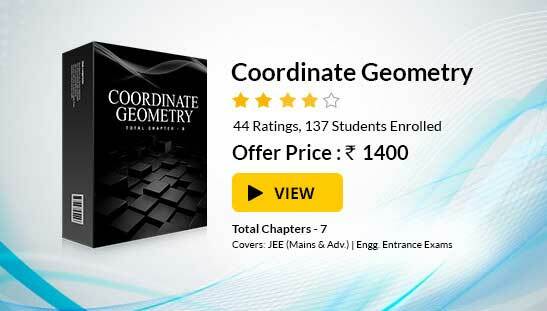 Various competitive exams like the JEE usually ask several questions from this topic. Students planning to take such elite exams must try to cover all possible topics of IIT JEE Mathematics including straight lines in order to remain competitive in the JEE. Reduce 3x – 4y + 5 = 0 to all other forms. The straight line drawn through the point P(0, 3) and making an angle of 30o with positive x-axis, meets the line x + y = 6 at Q. Find the length PQ. Find the equation of the line whose perpendicular distance from the origin is 4 units and the angle which the normal makes with positive direction of x-axis is 15o. Here, we are given p = 4 and ω = 15o. or (√3 + 1) x + (√3 – 1)y = 8√2. This is the required equation. Find the equation to the straight line which passes through the point (–5, 4) and is such that the position of it between the axes is divided by the given point in the ratio 1 : 2. Let the required straight line be (x/a) + (y/b) = 1. Using the given conditions, P (2a+1.0/2+1, 2.0+1.b/2+1) is the point which divides (a, 0) and (0, b) internally in the ratio 1 : 2. Hence –5 = 2a/3, 4 = b/3 ⇒ a = –15/2, b = 12. Hence the required equation is x/(–15/2) + y/2 < θ < π. ⇒ tan θ = –√8 = slope of line. 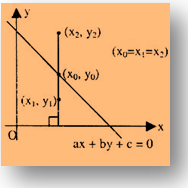 We know that the equation of the straight line passing through the point (x1, y1) having slope m is y – y1 = m(x – x1). ⇒ √8 x + y – √8 – 2 = 0. Find the equation of the line joining the points (–1, 3) and (4, –2). y – 3 = 3+2/–1–4 (x + 1) ∝ x + y – 2 = 0. It is possible to find the distance of of a point form a line but how can we determine as to which side of the line does the point lie? Thus we observe that the point is on one side of the line, if put in the expression of line is gives one sign, while the point is on the other side of the line, if put in the expression of line it gives opposite sign. Represent the straight-line y = x + 2 in the parametric form. 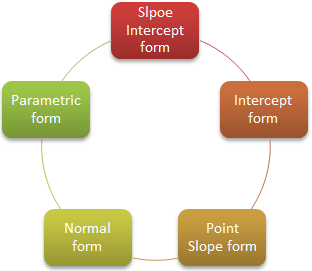 Slope of the given line is = 1 = tan π/4. Equation of the straight line can be written as y – 2 = x.
or y–2/1/√2 = x/1/√2= r.
Any point on the line is (r/√2, 2 + r/√2). The point (x, y) is at a distance r from the point (0, 2). 9x2 + y2 – 6xy – 54x – 62y + 241 = 0. A straight line moves so that the sum of the reciprocals of its intercepts on the coordinate axis is constant. Show that it passes through a fixed point. Let the variable line be x/a + y/b = 1. Then, we are given in the question that 1/a + 1/b = K, where K is a constant. This clearly represents a straight line through the intersection of x-y = 0 and Ky – 1 = 0. The lines intersect at (1/K, 1/K) and hence x/a + y/b = 1 always passes through the fixed point (1/K, 1/K). 2x + y + 11 = 0, x – 6y + 7 = 0. The gradients of the above lines are -2 and 1/6. This shows that θ is an obtuse angle. and so we have, tan θ = tan (180o – φ). So, we have tan φ = - tan θ = -(-13/4) = 13/4. A line joining two points A(2, 0) and B(3, 1) is rotated about A in the anticlockwise direction through an angle of 15o. Find the equation of the line in the new position. If B goes to C, what will be the coordinates of C, in the new position? Slope of BAB(m) = 1 ⇒ m = tan θ = 1 ⇒ θ = 45o. = tan (60o) (because angle between AB and AC = 15o). Also AB = AC = √2 and A is (2, 0). ⇒ C is (2 + √2.1/2, 0 + √2.√3/2) i.e. C is (2 + 1/√2, √3/√2). Find the distance of the point P(–2, 3) from the line AB which is x – y = 5. ∴ Changing the sign, perpendicular Distance in magnitude = 5√2. Draw the lines 3x + 4y – 12 = 0 and 5x + 12y + 13 = 0. 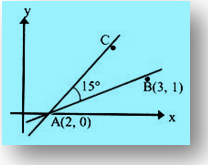 Find the equation of the bisector of the angle containing the origin. Also find the acute angle bisector and obtuse angle bisector. Let us make the expression on the left-hand side of the given equations of the same sign – or + ve. After substituting x = 0 and y = 0. To find out whether this is an acute angle bisector or obtuse angle bisector, let us find the sign of a1a2 + b1b2 from equation (1) and equation (2). The bisector containing the origin is the acute angle bisector. Now, for obtuse angle bisector, we take –ve origin. Well, to confirm all this, let us find angle between one of the lines and one of the bisectors i.e. ∴ 64x + 112y – 91 = 0 is an acute angle bisector. tan (–θ) = – tan θ. So only the magnitude of θ can be obtained. Further tan (π–θ) = – tan θ. Since magnitude also includes the other angle i.e. 3. When to use complete perpendicular Distance formula? 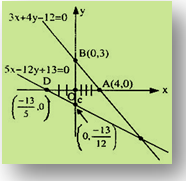 The complete perpendicular Distance formula is used when the length of the perpendicular to the line is given. If θ is the angle between two lines, then tanθ =  where m1 and m2 are the slopes of the two lines. (i) If the two lines are perpendicular to each other then m1m2 = –1. 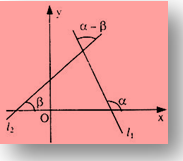 Any line perpendicular to ax + by + c = 0 is of the form bx – ay + k = 0. (ii) If the two lines are parallel or are coincident, then m1 = m2. Any line parallel to ax + by + c = 0 is of the form ax – ay + k = 0. You may wish to refer indefinite integral. To read more, Buy study materials of Straight Lines comprising study notes, revision notes, video lectures, previous year solved questions etc. Also browse for more study materials on Mathematics here.